Anything that has (Excellent) next to the title just has to be great, right? 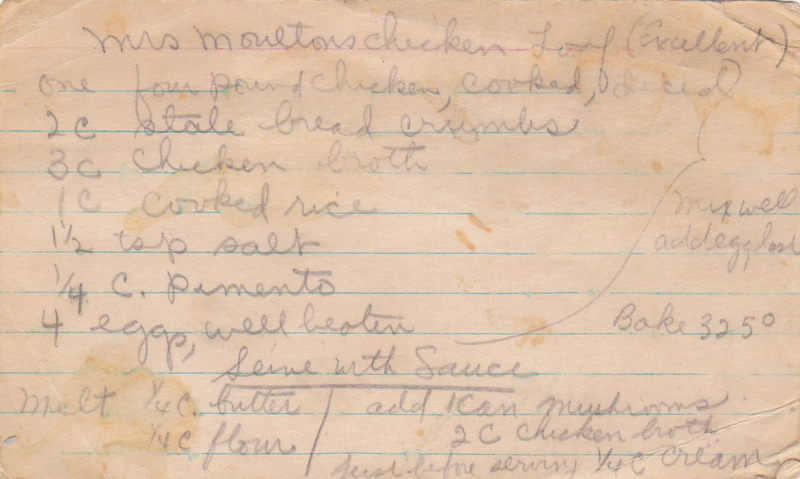 We’re not sure who Mrs. Moulton was, but my Great Grandmother apparently liked to serve this Chicken Loaf all the time for her bridge club. The greasy fingerprints and drips tell me this was definitely a well-loved recipe. At first glance, you’d think it’d be a meatloaf substitute, or something akin to the ham loaves we made last week. But when it really comes down to it, it’s actually a classic stretch-the-meat dish — with very little actual chicken-to-mass ratio. It’s bulked up with a lot of grains (bread crumbs & rice) as well as 4 whole eggs and some chopped pimento. The loaf itself turned out to be more casserole-ish than loaf, requiring a spoon for removal from the somewhat-inappropriate loaf pan. As for the flavor? My #2 succinctly put it, “Meh.” It was just okay. But then you add insult to “meh”, by topping it with a really gross sauce. 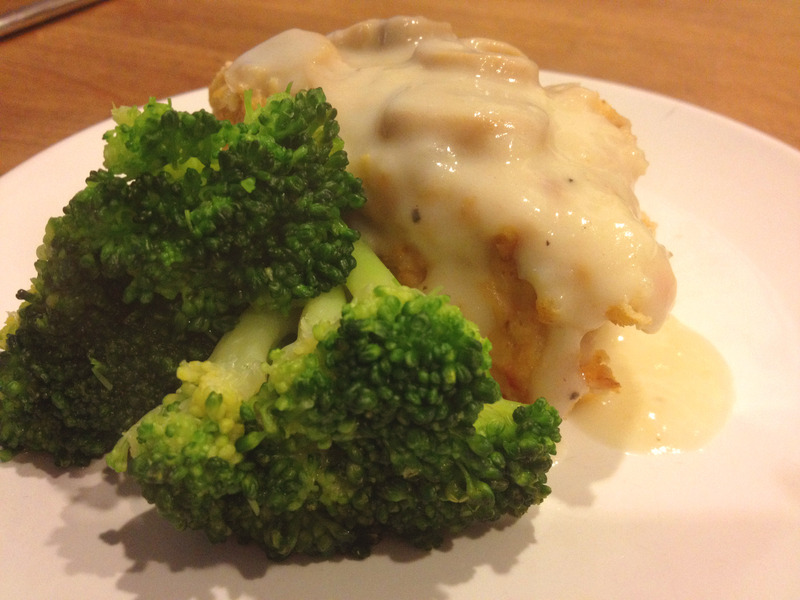 And the sauce itself shouldn’t be that bad, it’s just a normal white chicken gravy, but… canned mushrooms. Now, I know I don’t despise canned mushrooms in all their functions — I don’t hate canned mushrooms on pizza when it’s hiding with cheese and crust and tomato sauce, and I kind of like the jars of marinated mushrooms just for snacking on, but the canned mushrooms floating through this plain Jane white sauce were simply gut-wrenchingly gross — like little rubber erasers floating in chicken-flavored cream. I feel a little strange publishing a recipe that I wouldn’t wholeheartedly endorse actually eating, but for the sake of history, I’ll allow it. I can almost guarantee there are more recipes on the horizon that will not actually be palatable at all, so this is a good first step down that road. It’s really interesting to consider how tastes change over time, even our own tastebuds completely regenerate and are replaced by new cells every 24 hours (it’s true! ), so imagine what 100 years will do to a cultural palate. This recipe makes a lot of sense in a historical context as well, because chickens didn’t used to be mass-produced like they are today. A 4 pound chicken would’ve been a large, old bird — a “stewer” — probably not tasty enough for roasting, but would do in a context like this because it’s just chopped into little bits for flavor and not necessarily texture. We hardly ever see chickens that large these days. In any case, it did look pretty on a plate with broccoli, but to be perfectly honest, I would’ve taken 5 pounds of broccoli over this loaf any day. If you’re brave enough to try this, or if you’re looking for a fairly decent chicken casserole (we’re just not casserole people, but I know plenty of people are), this would probably be yummy with a crunchy buttery cracker topping, and I’m willing to bet you could freeze & reheat til the cows come home (or some other old-fashioned idiom). And whatever you do, for the love of your tastebuds, use fresh sauteed mushrooms in the gravy or skip it altogether. If you already have leftover rice on hand, this dish comes together remarkably quickly. It’s a good use for leftover chicken & rice from the night before — and if you don’t have this much on hand, even cutting this recipe in half would still yield a decent meal for 4. Mix together everything except eggs, then add the eggs. Put mixture in two parchment-lined loaf pans (or a large, shallow, buttered casserole dish if you prefer) and bake a 325 for 1.5 hours, or til it’s brown around the edges. Remove from heat and whisk in 2c of chicken broth and 1/4c cream a tiny bit at a time. Place back on heat after it’s lump-free (except for the mushrooms, of course), and stir constantly until thickened.